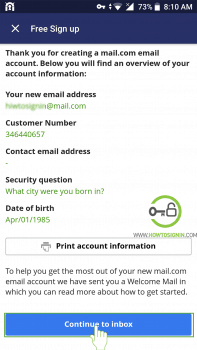 Mail.com sign up to create new free Mail account. Register now. Create free mail account with Mail.com. Mail.com is an email service provided by an internet service company United Internet based in Germany. With Mail.com sign up, you can create an email id with the unique domain as other email service providers don’t provide one or two domains to choose from. Mail.com gives you the option to select domain from its huge list of around 200 interesting domains that are likely to suit your purpose. You can use a different domain for different purpose like you can use diploma.com for your college purpose and photographer.com for your profession. In this article, we will provide you the simplified procedure to create mail.com account from both web browser and mobile application. Type mail.com in the address bar of any Web browser or directly visit Mail.com. Click on “Sign up” that lies towards the top right corner of the home page of mail.com just before “Log in” icon. Now you will be asked to enter information about yourself in the respective field. Select your gender from the drop-down list. Enter the country you live in. If your country is the United States, then you will have to enter the states you are from. Type the email id as desired by you and then select any domain from the range of domain provided in a drop-down list. You can choose the domain as per your interest like if you are an accountant, then you can select @accountant.com if you are fond of bike you can choose biker.com and so on. Provide contact email address. This could be used to recover your password in case you forget it. Provide the answer to the question. But keep in mind that you should not provide an obvious answer. You are not obliged to be the correct answer. All that is required is you got to remember them. As you are done providing all the required information to verify your registration by clicking on the box before “I am not a robot” and then click on “I Accept, create my account”. Finally, your mail is all ready to be used to send and receive email. 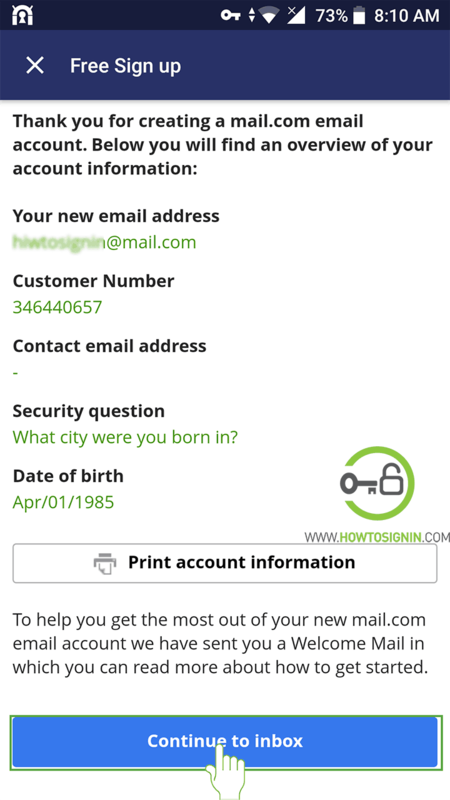 Mail.com sign up process does not require a mobile number to initiate new account so the security features like Two Factors Authentication could not be enabled. However there hasn’t aroused any major security issues in mail.com, this might be the reason why it is still one of the most used email services. 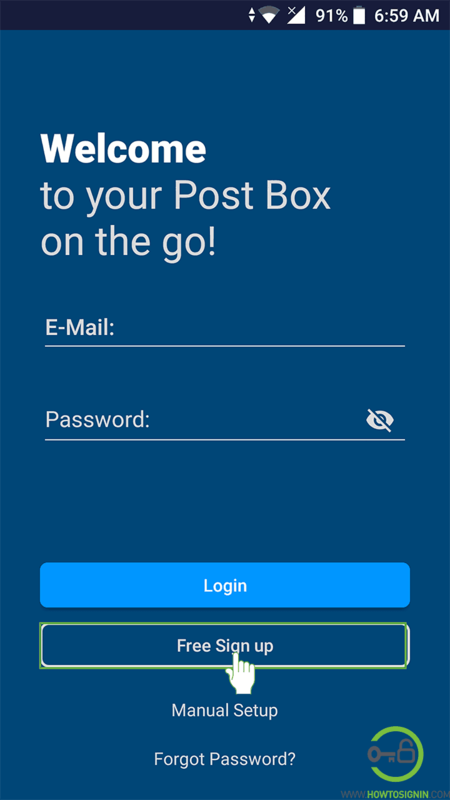 You can create free Mail account from the mobile app as well. 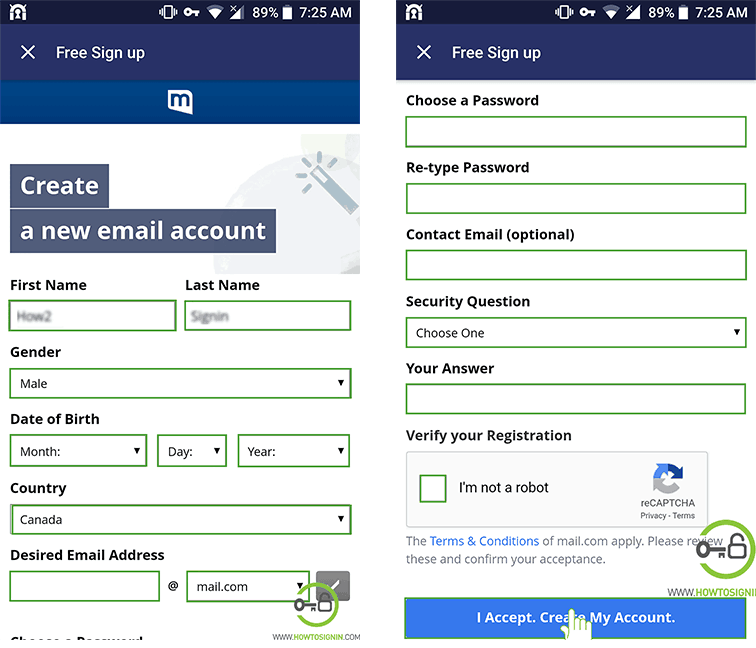 Mail.com sign up from mobile is very easy, and it takes only a couple of minutes to create a new account. 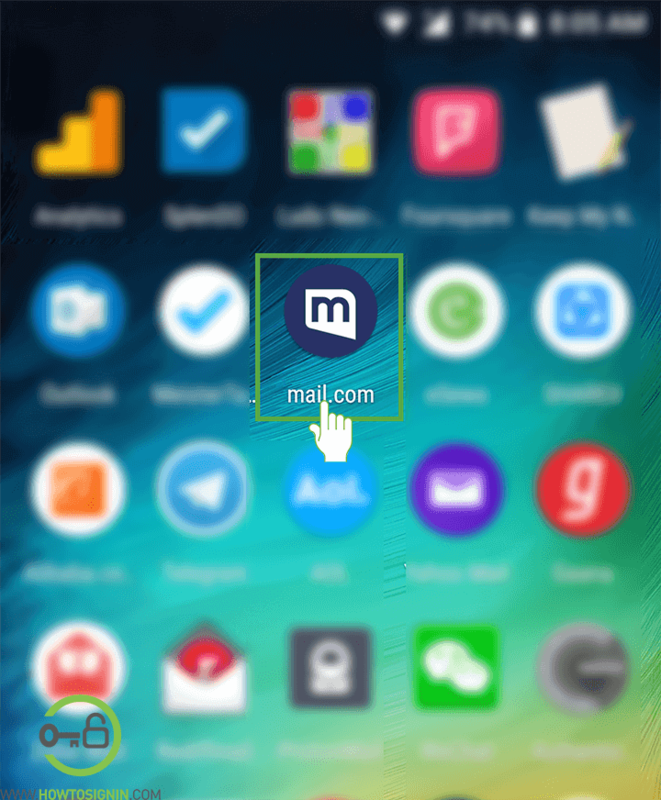 Go to the menu of your smart phone and then tap on the icon of Mail.com. 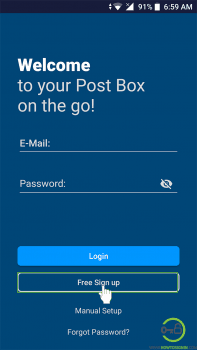 Don’t have Mail.com mobile app? Download it from Apple App store for iPhone and iPad. And get the app from Google PlayStore for android devices. In the home screen of mail.com tap on “Free sign up”. It will display all the features of email of mail.com. Tap on “Free Sign up” again. 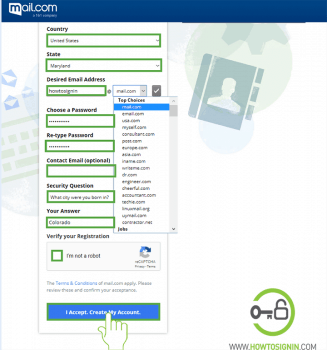 Now enter all your personal information like Full name, Gender, DOB and country. Type desired email address. The email address will be used as the username of your mail.com account so choose an email address that matches your personality and purpose. Select the domain from among the list of domain list that appears as you tap the small downward facing arrow at the side of domain field. Create a password using combinations of lower case and upper-case alphabets, numerical and symbols. After that retype the password manually to confirm. 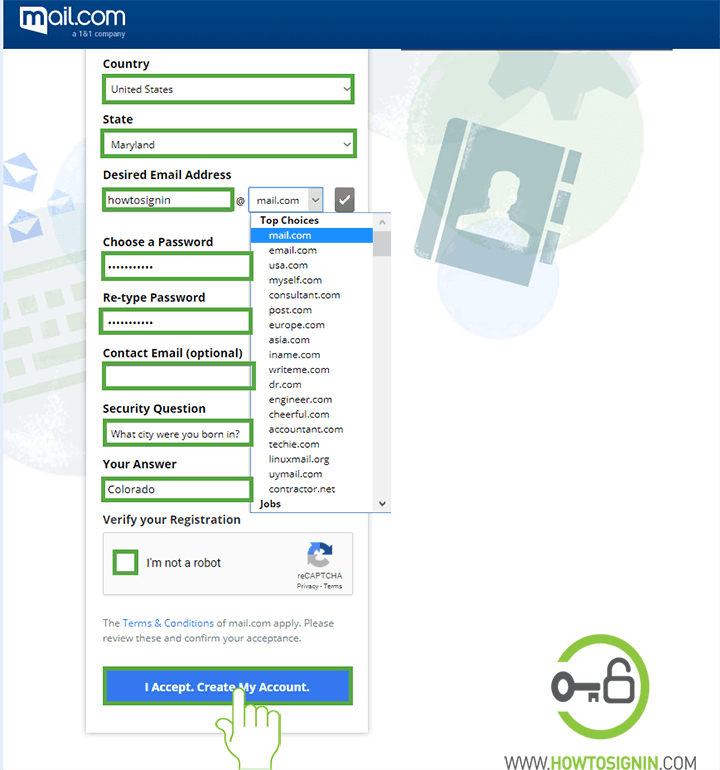 Provide contact email ID that will be required in case you forget your password. However, you can choose not to provide the contact email. Select the security question and answer it. The answer should be such that you will not forget them and other will not be able to guess it easily. Confirm your registration by tapping on the small box in front of “I’m not a robot”. Finally, tap on “I Accept. Create My Account” and you will have a brand new mail.com account. The general details of your account will be displayed on the screen. Tap on Continue to inbox and you can start using mail.com.